The awards were conducted based on a combination of qualitative and quantitative research techniques. Acquisition International say this proven approach ensures that the awards are allocated based on merit and means firms of all sizes and in all locations who have done extraordinary work over the past year can be recognised. The 2016 Global Excellence Awards were designed to recognise the very best in the business, whether they are a single office firm or an international conglomerate. We award the paragons, and the exemplars; those that are succeeding in their endeavours, innovating, growing and improving. This a huge honour, especially as this is the second year running we have been successful in gaining acknowledgement from Acquisition International Magazine. 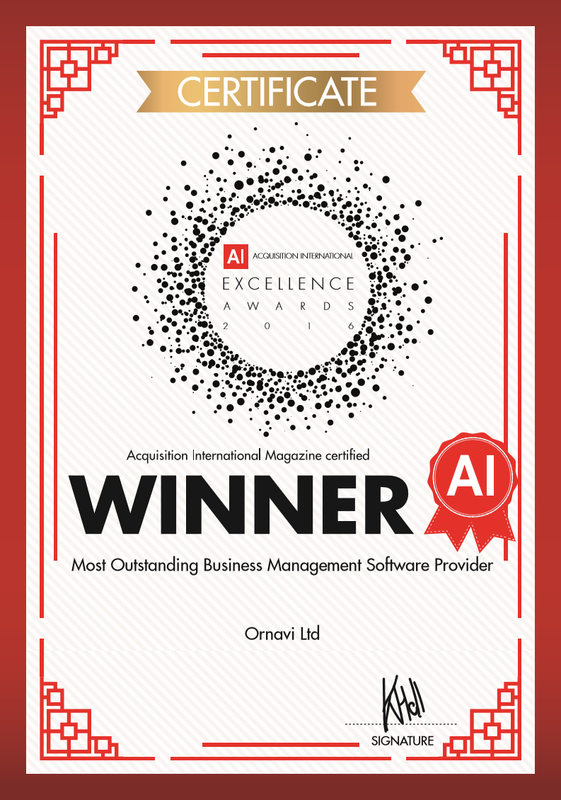 Here at Ornavi HQ we work hard to ensure we are bringing you the best Business Management Software we can so it is always great to have our efforts recognised. What a great start to 2017, we hope it is a sign of many more successes to come.